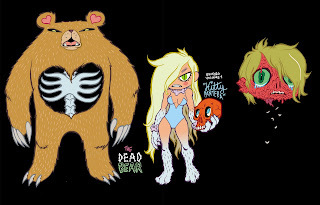 From left to right: Dead Bear, Kitty Pantera and Shino, the zombie boy. Some characters our trainee Bruno Orbit worked out in his time off the Donald&Simon manga, which will head in late 2009 your lusting readerheads. Me and Simon briefed to get this figs as toys to your shelfs, so stay tuned!